BEN Barba once again showed why he is the most exciting player in the NRL as Canterbury sealed a seventh successive victory with a 32-12 win against Parramatta at the Olympic stadium on Friday. The diminutive full-back scored another wonder try and set up three more as Des Hasler's team was made to work hard for its two points by a depleted but much-improved Eels side. 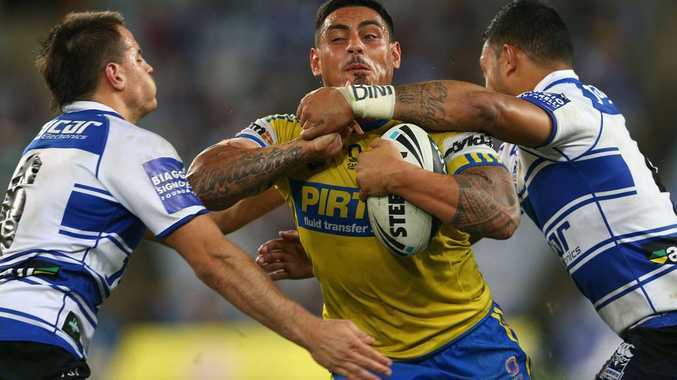 The lowly Eels, who were without the injured Jarryd Hayne and Matt Keating and the suspended Ben Smith, lost Fuifui Moimoi in the opening hit-up when he was caught across the jaw by the swinging arm of Sam Kasiano. Moimoi was slipping as he went down, but giant Kasiano was placed on report for the incident which saw the veteran prop helped off the field. The early signs looked ominous for the Eels, who shipped 34 points in the first half against Manly last week, with Josh Morris scoring a fifth-minute try. Read the full match report at ABC news online. Is Ben Barba set to be cut from Broncos?